Grevillea robusta, the Silky Oak is a fast growing tree to 40 feet or more. Grevillea robusta will often drop branches sometimes big ones. The area below the Silky Oak is covered in fallen leaves. The leaves on Grevillea robusta are large and deeply divided. This helps the leaves catch on anything and everything. Grevillea robusta is not the tree to plant in an area that needs to by tidy. On the other hand the leaf drop can be heavy enough to supress the weeds below it. Grevillea robusta has spectacular orange flowers and Orioles and hummingbirds love the trees. This is the perfect tree for an oriole to blend in, and they do. If you pick the right spot in the garden this is a great drought tolerant tree. Grevillea robusta is an excellent choice for a quick screen due to their fast growth. Grevillea robusta is a wonderful tall addition to the hummingbird garden. 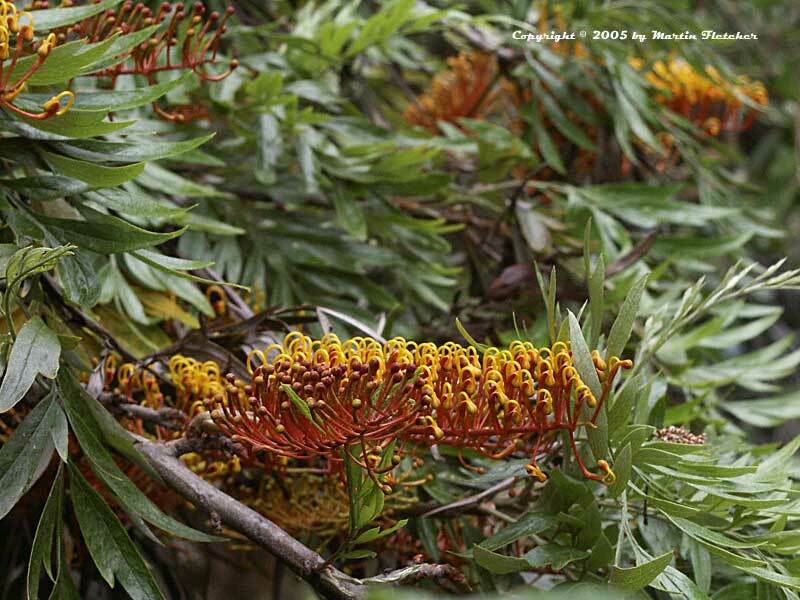 Orange flowers and foliage of Grevillea robusta - Silky Oak. High resolution photos are part of our garden image collection.